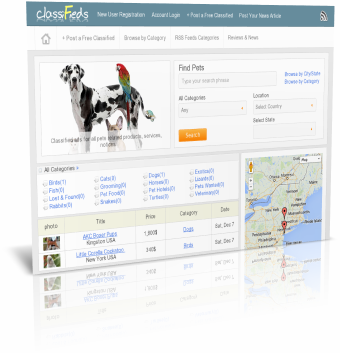 A powerful content management system which allows you to create and manage your own free animal classified ads website in a few minutes. It features Google AdSense integration, a RSS Feed enabled, a forgot password option to reset user passwords, generation of meta title and description tags for all web pages and free updates. 6. SEO Friendly Optimized URLs. 7. Private Message System with Email Notification. 8. Cache System to Reduce Page Load Time. 9. Search By City(State)/Postal Codes. 13. RSS Feed Enabled by Category. 14. Forgot Password Option to Reset User Passwords.